The first day of Spring has come and gone and despite the fact that there is still a foot of snow on the ground here, we are so excited for a warmer season! And warmer weather means it is time to get short sleeves and shorts in the closets. Now with four boys, I am thankfully able to hand down a lot of clothes to the younger ones, which saves me a considerable amount of money. We do need to purchase some new clothes every season for not just the oldest, but the whole lot as well because let's face it, boys destroy clothes. We are by no means fashion gurus in this house, but we do like to keep somewhat in style but within a reasonable budget. OshKosh B'gosh is a store I have shopped at since they were all teeny tiny things because I know I am getting good quality without breaking the bank. While we have a Carter's store nearby, we sadly don't have an OshKosh one. But I am a heavy online shopper and OshKosh.com is a very easy use site that had me finding what I needed and placing my order in just minutes. The first section I always hit up is the clearance section. Here you can find already reasonably priced clothes at considerable savings. I found t-shirts for my boys for just $5.99 which is pretty amazing. And I know that I will get at least two to three seasons out of them because OshKosh apparel always holds up well for us. In addition to the clearance items, even the new Spring items were marked down, up to 50% off! Everything I purchased was at least half off which led to an awesome bottom line for me. I ended up with 8 shirts and 3 pairs of shorts for under $90 when I used the coupon down below. 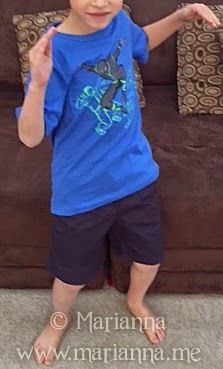 As you can see, one of the 7 year old's was excited to model his new ninja shirt. I knew that one was going to be a big hit. Overall I was extremely pleased with my shopping experience and the items that I purchased. I will say that the size 12 shirts that I ordered for my 10 year old were a bit on the small side (a little short) which was a surprise to me because he wears a 10/12 in most brands and in past experience OshKosh runs on the bigger side for us. However with 3 younger brothers, they will get plenty of use so I am not worried about it. Do you need to outfit your kids for Spring? Oshkosh has everything you could possible need for your boy or girl! Most new items are still on sale for up to 50% and the coupon below will give you an extra 25% off! It would be silly to pass up on this savings opportunity. 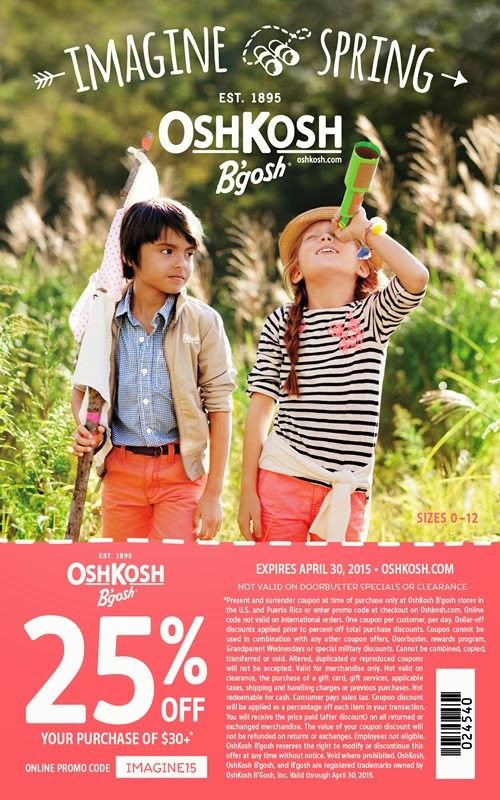 Visit the Oshkosh Store Locator to find one near you or shop online at OshKosh.com.